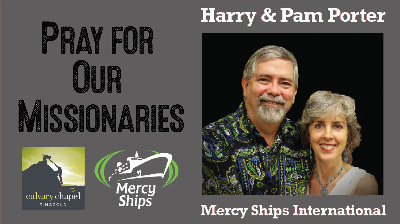 Harry and Pam have been actively involved with missions and evangelism since 1999. Committing their lives to follow Jesus Christ, they said, "we will go wherever, live wherever, and do whatever the Lord asks of them." Harry and Pam have ministered in Eleuthera, Honduras, Alaska, Tanzania, India, Algeria, Uganda, and Belize. Harry is a Doctor of Pharmacy, has a Masters in Cross-Cultural Ministry and years of management; ...And now serving as Hospital Ancillary Services Supervisor. Pam is serving the crew using her amazing gift of hospitality as a Steward. Won't you join them? Follow their blog, "Water Walking With Jesus," at: tentmakersonthego.blogspot.com for a personal look at what God is doing. In their monthly newsletter, read stories of what is happening on Mercy Ships: eepurl.com/mrjdn. Calvary Chapel | Ringgold will be praying about and seeking opportunities to come alongside other ministries, organizations, and individual families in the North Georgia community. If you have particular skills or interests, please let us know what you can do and how you would like to get involved. You can email us at calvaryringgold@gmail.com or speak with Pastor Mike via phone by dialing 706-952-1502. Calvary Chapel | Ringgold is presently assisting Christ’s Chapel Share & Care Mission in Ringgold, Georgia by stocking its food bank with food and clothing to be distributed to those in need in the North Georgia community. 223 Inman St., Ringgold, GA 30736.